North Korea asked the US to delay a planned high-level meeting between US Secretary of State Mike Pompeo and his North Korean counterpart Kim Yong-chol in New York, citing a hectic schedule, South Korea’s top diplomat confirmed Thursday. The State Department said Wednesday that the meeting between Pompeo and Kim, which had been due to take place in New York on Thursday, would now take place at an unspecified later date when their respective schedules permit. South Korea and the US tried to play down speculation that the meeting was postponed due to stark differences between Washington and Pyongyang on how the denuclearization process should proceed. The meeting was postponed at North Korea’s request because of the “hectic schedules” of both countries, the Foreign Ministry said. 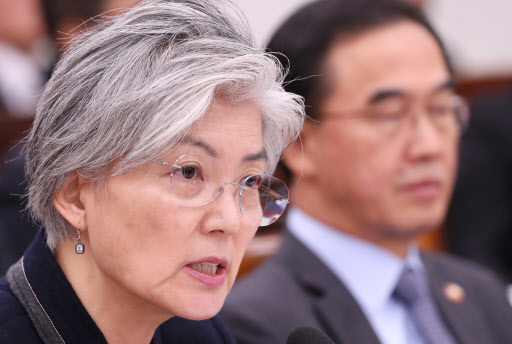 Kang cautioned against reading too much into the postponement, and said she would work through inter-Korean channels to urge North Korea to reschedule the delayed meeting. Kang said she is arranging a phone call with her US counterpart, Pompeo. Stephen Biegun, US special representative for North Korea, discussed the issue during a phone call Wednesday with his South Korean counterpart, Lee Do-hoon. “Schedules change. Schedules change all of the time in fact. ... This is the case we’re dealing with, purely a scheduling issue, and it’s as simple as that,” the US State Department’s deputy spokesperson Robert Palladino said at a regular briefing. There is speculation that Pyongyang postponed the meeting after it became clear its envoy could not meet Trump due to the president’s busy schedule. It may not have been ready to accept Washington’s demands for additional steps toward denuclearization, or it may have wanted to wait and see how things would unfold after the midterm elections, analysts say. The US and North Korea had been at loggerheads, amid an intensifying war of nerves concerning economic sanctions against North Korea, over who should be the first to make concessions before moving forward on denuclearization talks. North Korea is getting increasingly upset with the US for its refusal to offer sanctions relief and personal friction between US and North Korean negotiators that may be slowing progress, CNN reported, citing a source familiar with the situation. The US has been pushing North Korea to disclose an inventory of its nuclear weapons program and allow US inspectors to verify the dismantlement of its Punggye-ri nuclear site, its Tongchang-ri missile engine test site and possibly its Yongbyon nuclear complex. North Korea has demanded the US take “corresponding measures” in return for steps it has already taken. The North stopped conducting its missile and nuclear tests, dismantled the Punggye-ri site and returned the remains of some American soldiers killed during the Korean War. Washington wants the North to take more concrete, irreversible steps to denuclearize. One of the “corresponding measures” Pyongyang wants appears to be the easing of sanctions against it, while Washington maintains sanctions can only be lifted after the communist state completely denuclearizes.